The title Men of Different Concerns & Varying Talent comes from“The Photographer’s Eye” by John Szarkowski where he outlines the photographer's process. I was struck with this small phrase and I wondered if I might be all of these men on any one day. I gave myself the assignment to make images based on his categories: the frame, time, vantage point, the thing itself and the detail. In this first series of images, I used scraps of paper to crop a series of images that just weren’t working. The process was to rework them, to find a better image. It was similar to a painter cropping a view, or a photographer using an easel to mask out unwanted parts of an image, or an architect directing/framing our experience of entering or exiting a space. The contained area – within the white scraps – is where my original image was best cropped (rejected parts of the image were hidden by the overlaying paper). The crop could be in the center, bottom, left, right, etc. It could be big or small but was certainly different – a fraction – from the original. I then decided it would be better to get rid of the original image altogether as I found the layout and overlapping intersections of shapes were more interesting (I suppose I was looking for some way to get rid of an unsuccessful image). Within the crop I filled in with black. Anything outside of the white frame I left unaltered–the scanner’s original blue cast and my fingerprints from the glass. The proportion of the scanner’s bed was not altered. It was, as a photographer would say “full frame,” constant and not variable (a religiously pure act, although we know there is information outside of any frame). Ultimately paper replaced my original image; its placement and division of space became the subject. Its composition became a structure within a frame of the scanner’s bed. I placed one sheet of paper in the center of the scanner and recorded it multiple times. Because I left the the scanner's lid open, the light from the studio window – an early evening setting sun – created a different light reflections. Each scan generated a different background. If you look at the images in sequence you can see the colors change and the shadow of the white paper move behind it. What started out as a background – light and mechanics of a scanner – superseded the original foreground subject of paper. I like that there is a push/pull of what to focus on and look at. By elevating a sheet of paper over the scanner I could get different shapes. Depending on its placement I could make it appear as if it was falling. Again, the mechanics of the scanner bed became the background – a stage – for the suspended paper. But this time I controlled the light in the room in order to call attention to the changing paper. Paper returned as the subject – focus – of the image. A different vantage point was established each time it was composed. The scanner is a kind of theater for a performing piece of paper. Several layers of paper are composed on the scanner (one on top of the other) and then scanned. 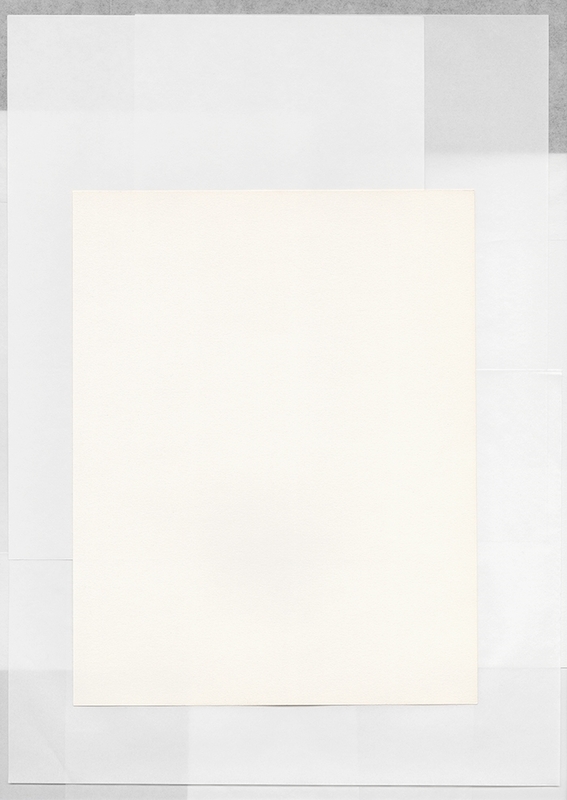 These 2D images have a false collage and 3D appearance (minimal depth of field, sheets of paper bleeding through another, black areas where nothing exists). The graphic layouts (sometime repeated from image to image) and opaque and transparent layers take on a sense of an architectural plan or program of a space. Our eyes travel from shape to shape, sometimes from foreground to middle ground to background. In printing this work I maintained a 1:1 scale to the original paper. The goal is to create images where the thing – paper – is untouchable. I wanted to experience it as a duplication or record of the original. But I also knew it would be printed and therefore the image of the image is made tactile again. This is where the series Works on Paper began. I have completed all but "The Detail," as I found it the most difficult to resolve. After looking for a solution for some time, I came across Hugh McCabe's interpretation of Szarkowski's detail ("Traces of the Real," National College of Art and Design, Dublin). McCabe described detail as "depicting reality as it happens, in the presence of the photographer... photography has to be content representing the details of a narrative or an event." This statement led me to the idea of creating an interactive piece where an image of paper is illuminated on a monitor, and remains static until approached by the viewer. When a camera sensor within the monitor identifies a person standing in front of it, the image of paper will move as if being blown by wind. Once the viewer walks away, the image returns to a state of quiet. In order to reinforce McCabe's notion of presence, "The Detail" uses multiple monitors to activate each image based on the physical location of the viewer. The work becomes an interactive experience, not "in the presence of the photographer" but rather in the presence of the viewer.